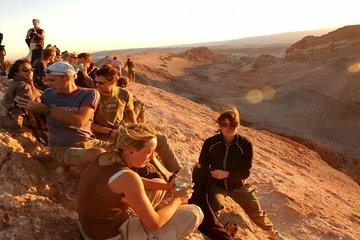 This 4-day tour of the Atacama Desert takes the planning and guesswork out of exploring the region’s highlights. Your guide accompanies you to the otherworldly landscape and salt caves at Valle de la Luna (Moon Valley), vibrantly colored red rock formations Chaxa Lagoon, and off-the-beaten-track sites that you might miss on your own. All transportation is included with daily hotel pickup and drop-off, so you can choose your own accommodation and meals to suit your tastes. Enjoyable adventure. Good interesting place to visit. Pickups were on time and enough was translated into English to meet requirements. Don't go by any confirmation pickup times received by e-mail, mine were completely wrong, stick with the times shown on the Viator site trip information.I stay at Quechua and would recommend it.